What is the origin and history of peanuts? Peanut butter was first introduced at the St. Louis World’s Fair in 1904 and became a source of delicious protein for soldiers during the first two world wars. European explorers first discovered peanuts in Brazil. As early as 1500 B.C., the Incans of Peru used peanuts as sacrificial offerings and entombed them with their mummies to aid in the spirit life. Tribes in central Brazil also ground peanuts with maize to make a drink. Peanuts were grown as far north as Mexico when the Spanish began their exploration of the new world. The explorers took peanuts back to Spain, and from there traders and explorers spread them to Asia and Africa. Africans were the first people to introduce peanuts to North America beginning in the 1700s. Peanut production steadily grew the first half of the nineteenth century. 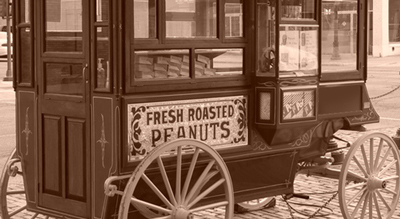 Peanuts became prominent following the Civil War when Union soldiers found they liked them and took them home. Both armies subsisted on this food source high in protein. In the early 1900s peanuts became a significant agricultural crop when the boll weevil threatened the South’s cotton crop. Following the suggestions of noted scientist Dr. George Washington Carver (link to Carver page), peanuts served as an effective commercial crop and, for a time, rivaled the position of cotton in the South. Peanuts are the 12th most valuable cash crop grown in the United States with a farm value of over one billion U.S. dollars.